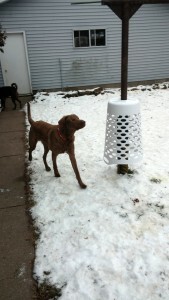 Blind dogs are amazing at mapping out their space but no matter how good they are, poles and posts are often a problem. I am not sure why but I suspect because they do not have a very large diameter and so are hard to lose track of in the grand scheme of things. I have two pesky poles in my backyard and one smaller tree. The poles belong to my clothesline and are only about 2.5″ in diameter. The tree is about 8-10″ in diameter. The poles are metal and seem to be magnets for Radar. 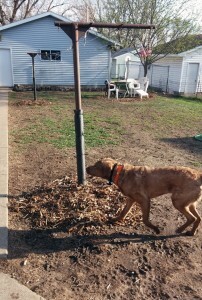 Radar with pipe insulation on the post surrounded by bark mulch. Within the first month, I wrapped the poles with pipe insulation. This works okay when he runs into them at a walk but they do not provide much cushion when he hits them at a run. Next I added dryer tubing. It is about 4″ in diameter and gave him some margin for error and warning space but not enough and he was still hitting the posts pretty hard. 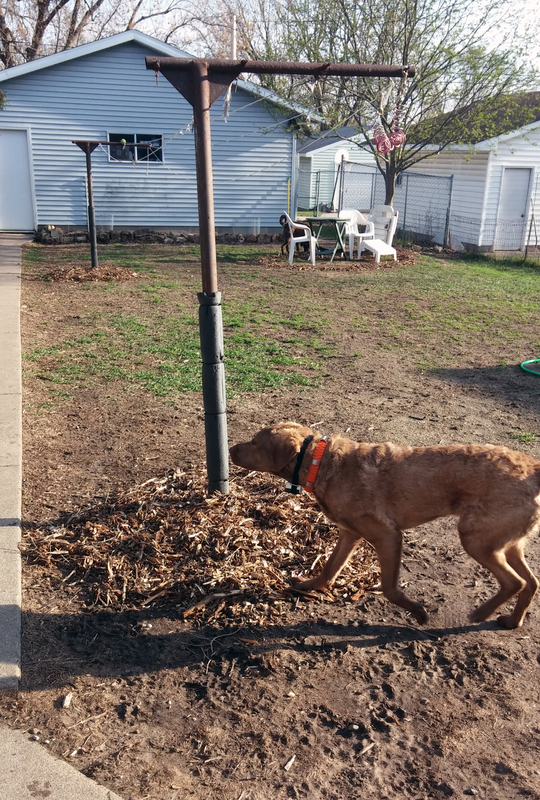 Next I tried adding bark mulch around the bottom of each post and made sure it reaches 10-12″ out from the bottom of the post. This works great in the summer for all paces except the flat out run and chase that happens with 2-3 year old pups. I live in Wisconsin so I had to adapt the mulch for winter. After the first good 4-6″ snow, I shoveled the snow around the post so that there is a 12″ bank around the pole and then an 18″ shoveled path around the bank. This gives Radar fair warning of the post. 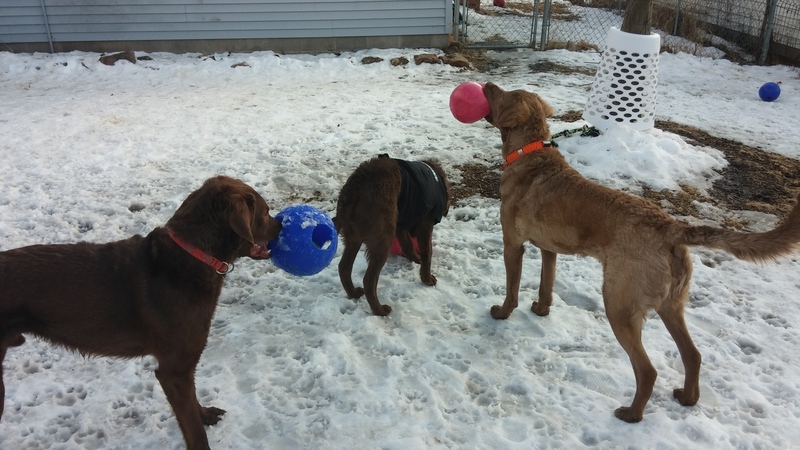 These methods all work pretty well for most of Radar’s time in my backyard but he is a 2.5 year old dog living with 3 sighted dogs under the age of 5 years. This translates into several games of chase, keep-away and tag. So when Radar is focused on finding his siblings, he is not great at recall his mapping or remembering the texture cues. After a few hard smacks into the post I knew I had to find a better “bumper”. Wandering through WalMart one day I saw the tall, flexible laundry baskets you see college students carrying home on weekends and thought maybe I could make that work. I bought one laundry basket, a multipurpose cutting tool and a bag of zipties. I got the supplies home, measured the diameter of the post with a piece of string and traced it into the middle of the laundry basket bottom. 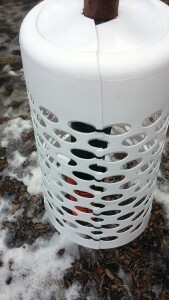 Using the multipurpose snips I cut up one side of the basket and then cut into the middle to the traced line. 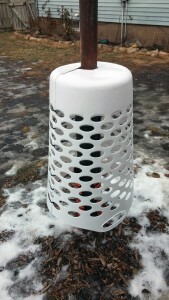 Once I had the middle circle cut out, I took my basket outside and wrapped it around the post. Close up of the “cut” and zip tie closure. It sits very nicely right on top of the pipe insulation section which allows the laundry basket to hang like a bell. I tested it with my arm from various directions and then brought Radar over to try it. 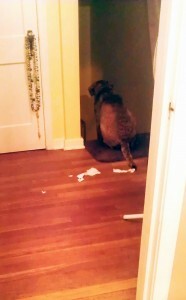 He sniffed it, pushed on it and then went off to play. Within 10 minutes the dogs started a game of keep away from Radar and WHAM! Radar ran into the basket. Except his WHAM! was really a whoops because the laundry basket never hit the post. It crushed under his impact but he veered off quickly enough that he did not encounter any concussion. I immediately purchased a second laundry basket for the second post. They have worked so well that I recently purchased a third laundry basket to put around my small tree trunk. Radar doesn’t often run into it but one of my sighted dogs smacked it the other day when he was too busy playing with a toy. I decided to try and fit a basket around the wider based tree trunk. It works well and I use a bungee cord to suspend it. Shortly after I added the basket to the tree, Radar ran into the edge of the basket and quickly adjusted without much impact or concern. I am sure this is not the answer for every dog or every pole but worth a review as I think it will work on many pesky poles, posts and smaller trees.